Recently, Mary’s Tack and Feed Apparel buyer, Marian, and her horse, Smokin Em Over, competed at the AQHA Level 1 Championships in Las Vegas in Showmanship, Trail and Horsemanship. This is just the fourth year that AQHA has held the Level 1 Championships. Proving to be an extremely popular show, the classes were huge! Over 1,925 horses competed at South Point Equestrian Center, home to the West coast Championships. Marian and “Ace” won Select Showmanship in a large class of 50 competitors and were named Champion! 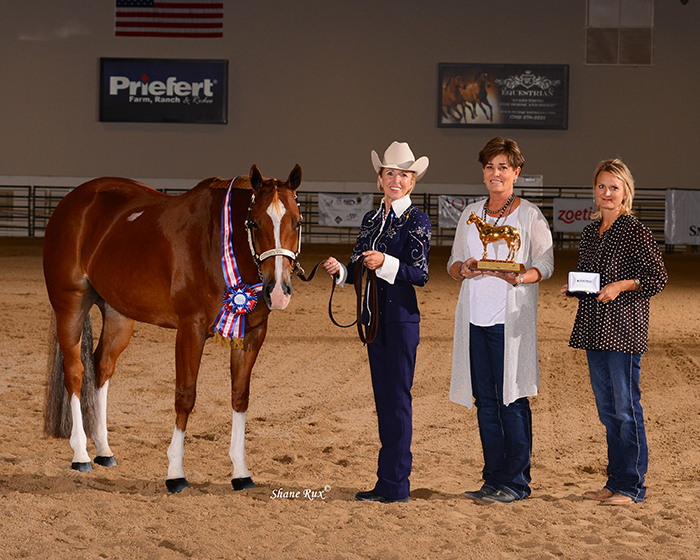 Here they are accepting their prize of the AQHA gold trophy, neck ribbon, and Champion buckle. Showmanship is this pair’s favorite class so it was a big win for them both! In Trail, they also placed in the Top 10 in a class of 53 placing 8th overall. The 2015 Championship show was a highlight of their show career to date! Marian and “Ace” accepting their championship prizes: a ribbon, trophy, and buckle.